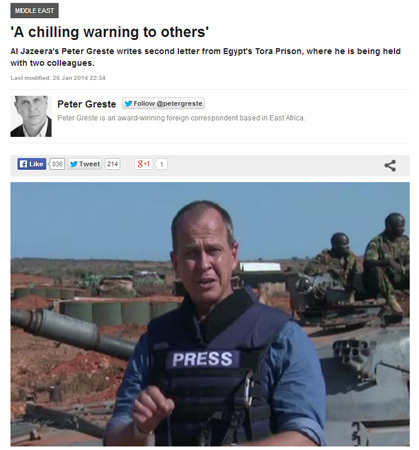 Peter Greste writes on his surprise of being arrested for his reporting. The fact that we were arrested for what seems to be a set of relatively uncontroversial stories tells us a lot about what counts as “normal” and what is dangerous in post-revolutionary Egypt. our arrest has served as a chilling warning to others of where the middle is here. Interim president says he will change "roadmap" to call early presidential election, and vows to combat "terrorists". country's transition to democracy. "These terrorist attacks aim to break the will of Egyptians,'' he said. "I tell those terrorists your despicable acts will not realize their goals." He vowed that the government will fight the violence "relentlessly'" and "mercilessly"
He added that he appealed to the prosecutors to review the cases of detainees held without charges from protests, including university students, to ensure that those held for no reasons are released. Thousands are believed to be locked up following an intense government crackdown on dissent. We were on the streets yesterday to mark the revolution, God's victory is looming large. Terrorism is a tool of the weak, and my confidence in Egypt is firm and unshaken. We will fight terrorism without mercy those who have abandoned the nation. The homeland is precious and dear. We will do our best to safeguard your lives. Priority goes to securing nation and we will increase courts dealing with terrorism. I have asked public persecutor to speed up investigation with detainees and release those found innocent. 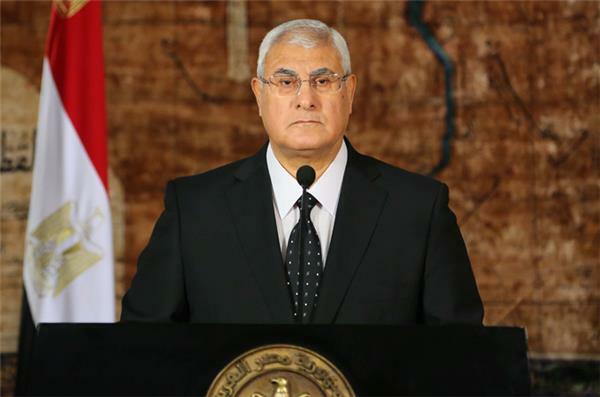 Just in: Egyptian President Adly Mansour now giving a live televised national address following the #Jan25 anniversary. "We will do our best to restore and safeguard security." Conflicting death toll reports as Anti-Coup activists say at least 40 dead while Ministry of Health says nine. One person has been injured in a bomb attack and gunfight on a Central Security Forces camp in Suez, according to MENA. An explosion has been heard near a building in Suez that was housing riot police in the city. Reuters reported the blast, citing security forces saying three attackers had planted the bomb and then fled before the explosion. Al-Qaeda's leader says that Egypt's majority Muslims should not fight their Christian compatriots, even though the head of their church supported a military coup that deposed the president. In an audio message posted on militant websites early Saturday, Ayman al-Zawahri said it was not in the interest of Muslims to be engaged with the Christians because "we have to be busy with confronting the Americanised coup of el-Sissi and establish an Islamic government instead." soldiers on Saturday, medics said. In what appears to be a relatively calm day so far, only a couple hundred pro-government people have gathered in Tahrir. State TV is also showing small rallies loyal to the government in Alexandria, Suez, and Sohag. Egypt marks the anniversary of the uprising that toppled President Hosni Mubarak on January 25, 2011. Al Jazeera's Mike Hanna looks back at the turbulent events of the past three years. On their twitter page, the Muslim Brotherhood denied responsibility for today's attacks. 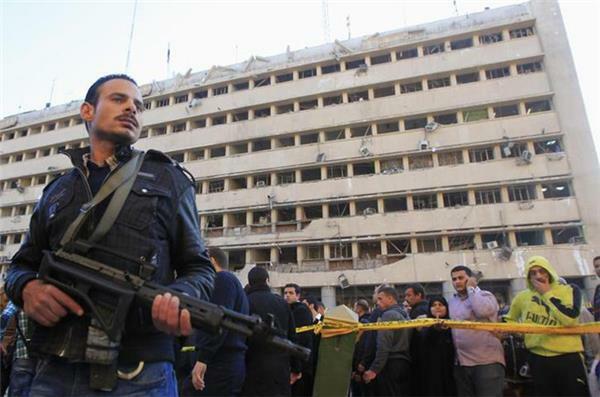 At least five people have been killed in three bomb blasts in Cairo apparently targeting police, the largest of which destroyed the façade of the police’s security directorate headquarters. The first blast at the police HQ, at about 6.15am local time, killed four and injured about 70 others, according to state sources. 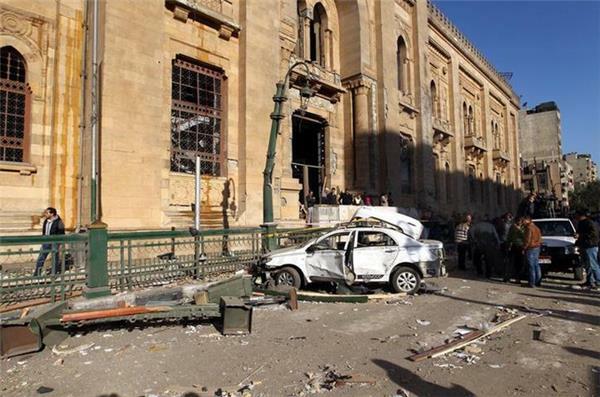 The blast, reportedly a bomb in a vechicle, also damaged the nearby Islamic Museum building. Local media reports claim a third explosion took place in Cairo. More news to follow. There are unconfirmed reports that all the roads leading to the Interior Ministry are closed. A car bombing exploded on early January 24 hitting police headquarters in central Cairo, leaving at least four dead, state television reported. The attack also injured at least 70, according to health authorities. It was not immediately clear if the casualties were policemen or civilians. According to media reports one of the dead was a suicide attacker. The blast damaged the building and an adjoining museum. Confirmed: second blast in Cairo kills one, according to state television news. Unconfirmed reports on Twitter are claiming a second blast went off outside a metro station. Thousands of supporters of Egypt's powerful army chief have rallied in Cairo, urging him to run for president. 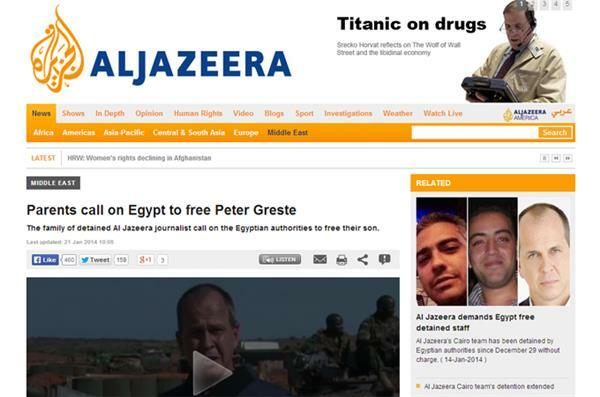 The parents of Al Jazeera correspondent Peter Greste have appealed for their son's release from an Egyptian prison, saying the accusations levied against him are preposterous. Egypt's election committee says 98.1 percent of voters have approved a new, military-backed constitution in the first vote since a coup toppled President Mohamed Morsi. Egypt's High Election Commission said on Saturday that 38.6 percent of the country's more than 53 million eligible voters took part in the two-day poll. That's 20.5 million voters casting ballots. This is the first vote since the military removed Egypt's first freely elected president, Mohamed Morsi, following massive protests in July. More than 20 million voters participated in the polls that were supervised by more than 15,000 judges, says electoral commission. The turnout in Egypt's constitutional referendum "reached 38.6 percent," higher than that in a 2012 referendum under ousted president Mohamed Morsi, the electoral chief said at a press conference on Saturday. Supporters of ousted Islamist President Mohamed Morsi continued their rallies against the referendum on Friday, with dozens taking to the streets in Egyptian cities and clashing with security troops. Security reports said protesters were armed with shotguns and petrol bombs, which according to a report were used against citizens. An official report showed that five were injured and at least one was killed. The death happened in Egypt's southern city Fayoum. In Cairo there were clashes near Al-Azhar University and the dorms of Cairo University and some students complained that their studies have been disrupted by the protests. Streaming TV and movie provider Netflix won its first Oscar nomination Thursday for "The Square," a documentary about the 2011 revolution and ongoing strife in Egypt. The movie, to be released on Friday, recounts the turmoil in Egypt centered on Cairo's Tahrir Square since the uprising nearly three years ago that ousted long-time president Hosni Mubarak. Netflix made television history last year when its political drama "House of Cards" became the first online-only series nominated for a major Emmy award. Last weekend, Netflix won its first Golden Globe, with Robin Wright taking best drama actress for her "Cards" role as the wife of Kevin Spacey's scheming congressman Francis Underwood. It bought the streaming rights for "The Square" in November, after the documentary won critical acclaim on the festival circuit. The film follows the revolution through the eyes of six different protestors, starting in the tents of Tahrir Square before Mubarak's fall, according to the movie industry website IMDb. "This film and this nomination is in honor of not only people in Egypt, but for all who are still struggling," the film's director Jehane Noujaim said in a statement emailed to AFP. "We made this film to tell the stories of people who are risking all that they have to fight for change -- and to share their hopes and dreams with the world," he added. He added: "Making this film took us into Tahrir Square and revealed the beauty, power and courage of people -- a courage that has taught us and inspired us, and has personally changed our lives forever. "The struggle for human rights and freedoms is a universal one and this nomination is an international recognition of that struggle and of that right to have expression. A coalition led by Morsi's Muslim Brotherhood, which has organised near daily rallies against his overthrow, claimed the referendum was a "farce" and pledged further protests. "We will continue the days of rage," the Anti-Coup Alliance said in a statement. 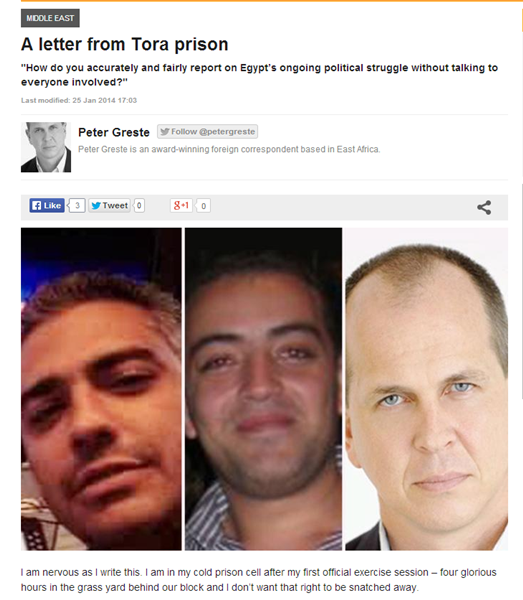 Al Jazeera has denied that its journalists held in Egypt have confessed to the charges leveled against them. “The accusations against our journalists do not stand up to scrutiny. Our detained team had been working in Cairo for some time and people can still watch their work online. 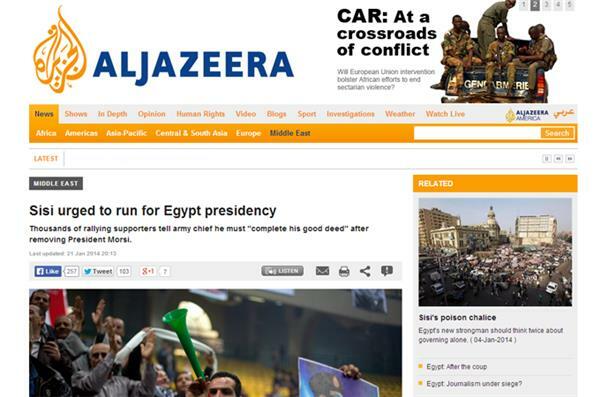 It was all of the highest journalistic standards and integrity, as has been all out output since the start of the momentous events in Egypt three years ago. "The prosecutor’s measure of issuing a statement like this is unusual, as it looks like a prejudgment on an ongoing investigation. Claims that anyone has 'confessed' are rejected by our journalists and legal team. About 28% of Egypt's more than 52 million eligible voters have participated in the first day of constitution polls, state-run Ahram newspaper quoted Minister of Administrative Development as saying. Hany Mahmoud said this percentage is not official but is "indicative," according to the newspaper. Results of the constitution referendum will be announced 72 hours after polling booths close, Al-Yawm el-Sabea reported, citing the Higher Elections Commission. Polls end today at 17GMT. Three members of a trade union abducted last week in Egypt's restive Sinai were freed Wednesday after a ransom was paid for their release, security officials said, with a fourth man still held. The four men, an official from the labour ministry and the three union members, were snatched while travelling to a conference in the southern resort town of Sharm El-Sheikh. This video shows supporters of army chief General Abdel Fattah al-Sisi dancing to a song dedicated to him, named "Bless your hands." The cheerful crowd are standing in balconies overlooking a balloting booth, and are making hand gestures in reference to Sisi, who's decision to for presidency may hinge on the polls' results and turnout. Al-Yowm El-Sabea newspaper reported that security forces arrested a voter who wrote "No to the Military Trials of Civilians" on his electoral form. The judge monitoring the voting process in the Nasr City's balloting booth saw the remark and reported it to the police who took the voter in for questioning, the newspaper said. Citizens boycotting the constitution criticize it for not putting a ban on referring citizens to military tribunals. 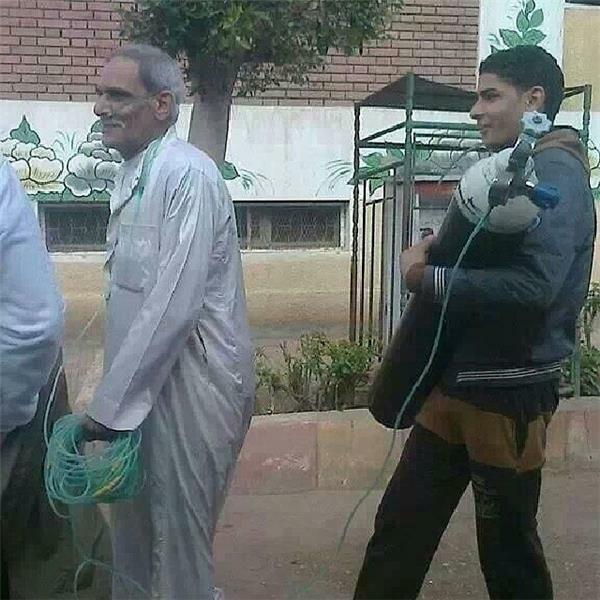 This picture shared on Instagram shows an old man who is attached to an oxygen tube, stands in line to vote on the constitution. There were no further details on where about in Egypt was this image taken. Anti-coup protesters, boycotting the ongoing vote on the constitution, are staging marches in Giza, Sohag, Menya and other parts of the country. Egyptian local newspaper al-Yowm al-Sabe reported the arrest of a 18-year old student and a worker carrying a school bag that allegedly contains 11 Molotov cocktails. Security forces in charge of protecting polling booths detained the two who allegedly confessed of planning to stage attacks against voters, the newspaper said. The second day of a vote on the constitution has started in Egypt, amid protests by anti-coup protesters in the capital's suburbs. Al-Shorouk Newspaper reported today that the votes of Egyptians abroad have been tallied and will be received by the Higher Elections Commission today, while initial reading indicates that the majority voted in favor of the constitution. The Egyptian diaspora community, which is about 640,000 citizens, voted from January 8 to 12 in at least 160 countries.